A Burundian general who backed a failed coup in May has threatened to launch an armed uprising after President Pierre Nkurunziza refused to bow to opposition and international demands to abandon his bid for a third term. General Leonard Ngendakumana, a deputy to the leader of the aborted coup, accused Nkurunziza of dragging the central African country back into civil war, comments that have alarmed a region with a long history of ethnic conflict. “The next [step] is to organise ourselves just to resist, to make Pierre Nkurunziza understand that he must leave and then that we are prepared to do it by force, by organising a military force,” Ngendakumana told Kenya’s KTN television, adding that coup leader General Godefroid Niyombare was still in Burundi. The government told the Reuters news agency that any such move would be confronted. “Anybody threatening the security of Burundi, either inside or outside, will meet the full force of our defence and security forces,” presidential spokesman Gervais Abayeho said. Ngendakumana said Burundi’s government wanted “to engage the region in that civil war, based on ethnic [issues]”. The general’s interview was recorded on Sunday in an undisclosed location outside Burundi before Monday’s meeting in Tanzania of east African states, plus South Africa, who are seeking to end the crisis. At the meeting in the capital Dar es Salaam, the nations called for the July 15 Burundi presidential election to be delayed to July 30, to allow mediation between opposing factions. The government has dismissed previous calls for delays. 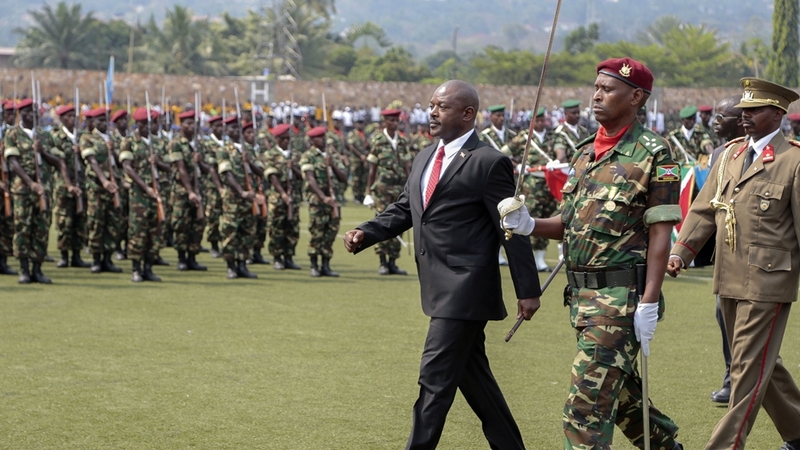 Opponents argue Nkurunziza’s bid for a third term – which triggered weeks of violent clashes between protesters and police in Burundi’s capital – violates the constitution and a peace deal that ended an ethnically charged civil conflict in 2005. Nkurunziza says a court ruling allows him to stand again. As well as calling for an election delay, the African nations said it was appointing veteran Ugandan President Yoweri Museveni to establish a dialogue between opposing sides. The Arusha peace accords ended a 12-year conflict that pitted rebel groups of the majority Hutus, including one led by Nkurunziza, against minority Tutsis, which commanded the army at the time. The army and other institutions are now mixed. Ngendakumana said followers of the coup leaders were behind a spate of grenade attacks, which often targeted police, in the run-up to parliamentary elections held on June 26. “We are behind them, and our intent is to intensify,” he said when asked about the incidents. UN observers said the June vote was not free or fair, an assertion the authorities dismissed. The opposition has said it will boycott all the polls. The post Burundi coup general threatens force to oust president appeared first on African Media Agency.